I had a wonderful ten days in France this past summer walking for Our Harbour. After arrival at Ch. de Gaulle airport in Paris, I took the TGV train to Lyon where I was met by my friend Chris whom I met when he was a volunteer for Our Harbour. He was living in Clermont-Ferrand at the time of the walk. We drove to Le Puy-en-Velay which is the start of one of the branches of the Camino de Santiago. The town has a beautiful basilica where we had a glass of wine after compline that was intended as a blessing to new pilgrims. We were on the trail early next morning and soon met a “guide” who encouraged us to take an alternative route so that we could see an ancient Roman Church. The promise was that the alternative route was shorter but in reality, this proved not to be the case but it was a lovely church! 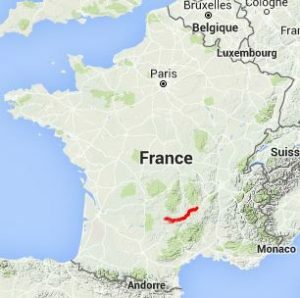 The trail was one of the major hiking trails common in France, the GR 65. The actual path of the ancient Camino has long been lost but the towns along the way all have a churches or monasteries that have always been on the pilgrims’ route. The signage is the red and white horizontal stripes used to mark hiking trails throughout Europe. The route was changed in the 1990s to provide more spectacular views but in some cases it added several kilometers (i.e. hours!) to the path. The trail for the first few days was more challenging than anything in Spain but this was balanced by more comfortable hostels and better food. The nicest accommodation for me was a hostel built in the most desolate part of the journey that was a converted farm owned and managed by the local agricultural cooperative. It offered large airy dormitories, a laundry, a well-stocked bar, Wi-Fi and an excellent meal. The barman even offered me his own laptop so I could write my blog. We were lucky to have reservations; several people had to go on to the next village 8 km away. After a tough day, the extra walk exhausted them and made the next day difficult. The prettiest villages are Saint-Côme-d’Olt, which had a well-kept convent with a beautiful courtyard full of flowers – a great place to read, and D’Estaing, the location of a château, a huge building dominating the village that has been the home of Valerie Giscard d’Estaing’s family for hundreds of years. As with my previous Camino experience, the pleasure of the trip is the people one meets on the way. There is a feeling of camaraderie amongst the pilgrims that one rarely finds on a vacation. They look out for each other, share food and talk at the communal meals. Most of the pilgrims this time were French but I walked with a Haitian doctor who wished he had decided to live in Montreal rather than in Paris, an Australian couple who help rescue people lost in the outback and an Austrian on a wooden bicycle that he walked on the flat but could free wheel downhill. He claimed to have started in Austria and planned to push/ride the bike to Santiago. The end of my walk was in Conques, a beautiful little town on the edge of a mountainside overlooking the river Dourdou. The Abbey, built in the 13th century to serve pilgrims, is very active with a surprising number of young European men training there for a monastic life. Almost everyone attended Nocturnes then went on to an interpretation of the bas reliefs surrounding the main door. Altogether an exceptionally beautiful walk through the French countryside, several enjoyable encounters with other pilgrims and a successful fund-raising adventure for Our Harbour.